Also serving communities of Milford. There are 22 Assisted Living Facilities in the Shelton area, with 3 in Shelton and 19 nearby. The average cost of assisted living in Shelton is $4,500 per month. This is higher than the national median of $3,346. Cheaper nearby regions include Trumbull with an average starting cost of $4,462. To help you with your search, browse the 136 reviews below for assisted living facilities in Shelton. On average, consumers rate assisted living in Shelton 4.4 out of 5 stars. Better rated regions include Trumbull with an average rating of 4.5 out of 5 stars. The city of Shelton, like much of Connecticut, has a small-town New England feel. There are 41,296 people in Shelton with three Assisted Living Facilities (ALFs) in town and an additional 18 in the surrounding area. Assisted Living Facilities in Connecticut are referred to as managed residential communities (MRC) and primarily serve adults 55 or older who need assistance with health, nursing or activities of daily living (ADLs). Connecticut doesn't license ALFs, but the agencies who provide these services. These "assisted living service agencies" are licensed by the Department of Public Health (DPH). Shelton lies in Fairfield County which received mix ratings from the American Lung Association. The Ozone grade is poor with an F ranking, while the Particle Pollution 24-hour score is a B. Seniors with a respiratory illness may be adversely affected by these conditions. The nearby city Newtown is a member of the AARP Network of Age-Friendly Communities, meaning that its elected leadership “has made the commitment to actively work toward making their town, city or county a great place for people of all ages,” according to AARP. The Shelton area is home to world-class medical facilities, including Griffin Health in the event of medical emergencies or illness. The cost of living in Shelton is 35.9 percent higher than the U. S. national average. Seniors without a lot of expendable income should consider how this could affect their finances. The climate in Shelton is typical for the Northeast. Shelton receives 33 inches of snow per year and experiences January low temperatures of 19 degrees. While summer is comfortable with an average high of 82 degrees, seniors make have difficulty staying active during the winter. The crime rate in Shelton is very low compared to the national average. Violent crime ranked 20.9 out of 100 compared to the U. S. average of 31.1. Property crime is even lower at 18.6 to 38.1. This may give seniors and their loved ones an added sense of security. Assisted Living costs in Shelton start around $4,500 per month on average, while the nationwide average cost of assisted living is $4,000 per month, according to the latest figures from Genworth’s Cost of Care Survey. It’s important to note that assisted living rates in Shelton and the surrounding suburbs can vary widely based on factors such as location, the level of care needed, apartment size and the types of amenities offered at each community. 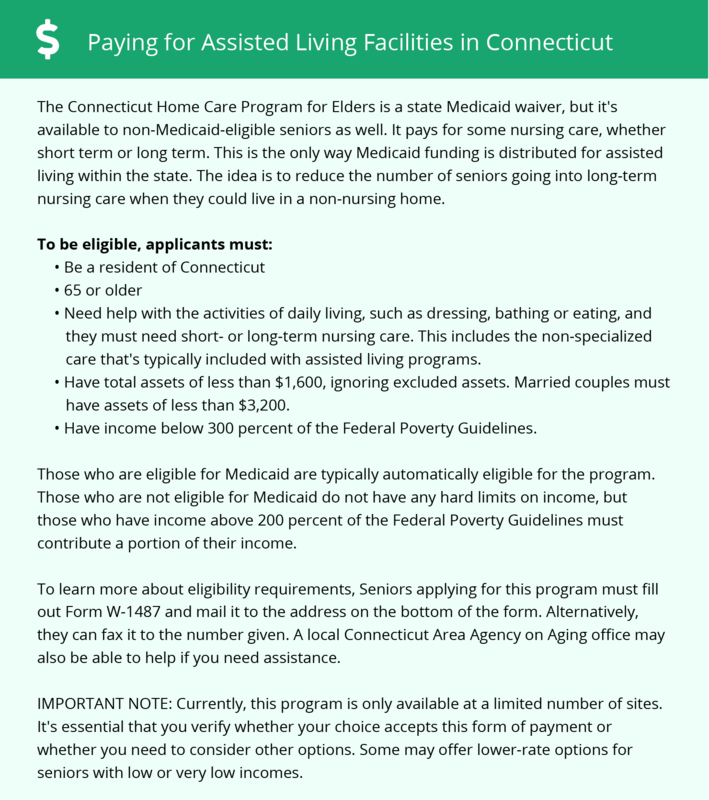 Eligible residents of Connecticut seeking financial aid for assisted living costs can apply for the state's Medicaid waiver program, the Connecticut Homecare Program for Elders (CHCPE). Seniors in private assisted living facilities have access to a small CHCPE pilot program. Shelton and the surrounding area are home to numerous government agencies and non-profit organizations offering help for seniors searching for or currently residing in an assisted living community. These organizations can also provide assistance in a number of other eldercare services such as geriatric care management, elder law advice, estate planning, finding home care and health and wellness programs. To see a list of free assisted living resources in Shelton, please visit our Assisted Living in Connecticut page. Shelton-area assisted living communities must adhere to the comprehensive set of state laws and regulations that all assisted living communities in Connecticut are required to follow. Visit our Assisted Living in Connecticut page for more information about these laws.